Paolo Soleri, age 91, won late-career accolades with the dedication last December 11th of his Pedestrian Bridge and Plaza along the Arizona Canal in Scottsdale. The project reprises Soleri leitmotifs; a history of bridge design first honored by the Museum of Modern Art in 1949, his earth-cast concrete techniques, cast bronze bells and his philosophy that a construction need never be just one thing. Consistent with the architect’s emphasis on urbanism, the bridge intervenes in Scottsdale’s pervasive car-culture as a pedestrian connector, linking a cluster of restaurants and bars with a residential complex across the waterway. It performs as a gnomon, two towers of burnished stainless steel focus the noonday sun on a crimson stripe down the span’s centerline. The Plaza self-announces with sound as ringing bells greet the walker’s arrival. A semi-circle of silt-cast concrete monoliths in cuneiform-like relief provide shelter from sun and wind and limn a gathering place. Concrete walls were cast against sculpted earthen forms. The Scottsdale Bridge is one of five built Soleri commissions so it shocks to know that concurrently with its construction another of the architect’s client works, the Paolo Soleri Amphitheater on the Santa Fe Indian School campus, was being consigned to possible demolition. The “outdoor theater bowl” commissioned in 1965 by Lloyd New, Native American founder of the Institute of American Indian Arts sits today on a treeless campus. 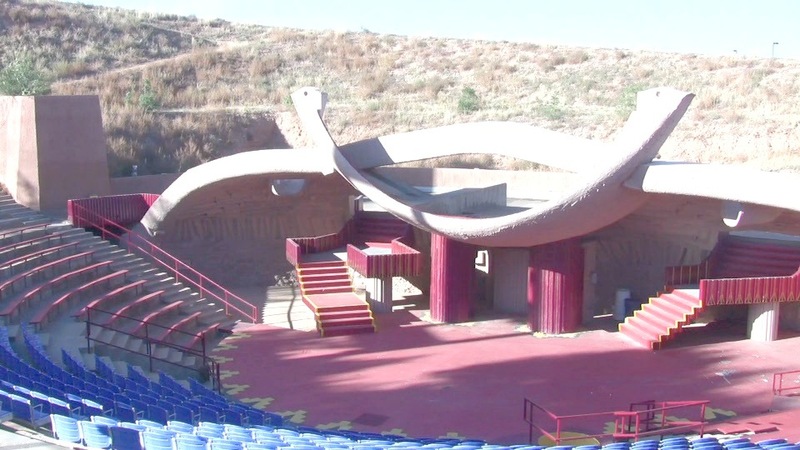 In spring 2008, without notice, Indian School administrators razed many old campus buildings conforming cosmetically to Santa Fe style but left one iconoclast, the Amphitheater, which in 2010 they revealed plans to level, unleashing a public debate. The Amphitheater had long been popular as an Indian School ceremony site and summer concert venue but examining Soleri’s drawings and the Institute’s archive, reveals a collaboration between architect and client of historic importance beyond its role as an event location. The swooping lines of its concrete form more fully represent Soleri’s earth-man-cosmos philosophy than his Scottsdale Pedestrian Plaza, though they share his earth-formed concrete techniques. They delineate a theater born as twin with contemporary Indigenous drama. In 1965, New and Rolland Meinholtz, head of IAIA’s theater department, studied the environments of Native ceremonies; Plains tribes’ panoramic expanses, the underground kivas of Pueblo peoples, and the Pacific Northwest longhouse – to derive the theater’s thematic language. From these vectors Soleri synthesized the design into a two-tiered Elizabethan playhouse schematic; main stage as embodied physical realm; upper stage as spiritual region. Soleri designed the theater literally into nature, sinking the stage below grade, piling the excavate spoils into a manmade hill, and leaving a view to the Sangre de Cristo mountains. Steep bench seating compresses the psychological distance between audience and performers. Two vomitoria tunnel from beneath the benches, projecting the actors as if from an underworld. Upstage, a cast concrete shell with acoustic faceting and a pebbled lower band evokes a cave. A scooping upper stage on hollow columns juts beneath a panoramic bridge that runs the shell’s edge. Two stairways flank the columns, then turn at platform landings, penetrating the shell. This vertical passage connotes transformation in Native narratives. Soleri programmed the upper level right-to-left to represent two symbolic modes: weather phenomena – and the diurnal cycle. He anticipated a geometric sun symbol at the midpoint (omitted in construction). The progression ends with a “moon” bridge traversing a canyon that slices down from the the grassy hill to lead actors and animals to the stage. Oneida playwright Bruce King relates that a canal once crossed the stage and that fusillades of arrows could launch from the hillside. Architecturally, this performance armature diffuses dramatic focus into a unique field of action. No other permanent American theater invites such physical engagement by actors and, indeed, weather (ironically, that planned-for phenomenon caused maintenance problems administrators cite as fatal). Swiss mime Jan Kessler inaugurated the theater on February 16, 1970. Rosalie Jones (Pembina, Chippewa) of the dance faculty went on to found Daystar, the first Native dance company. The theater has hosted 14 Native Roots and Rhythms Festivals, including choreographer Rulan Tangen’s (Metis) continuous dance. The mothballed theater, now encircled by chain link, shows only detritus of dust and leaves. But its long intermission should not foreclose a vivid rejuvenation of Soleri’s legacy architecture. Scottsdale’s vision in sponsoring the Bridge and Plaza points the way. You are currently browsing the Conrad Skinner Design blog archives for April, 2011.